Daphne at Daphne’s Caravans has been busy this summer and appears to have another beautiful wagon nearly ready to sell. 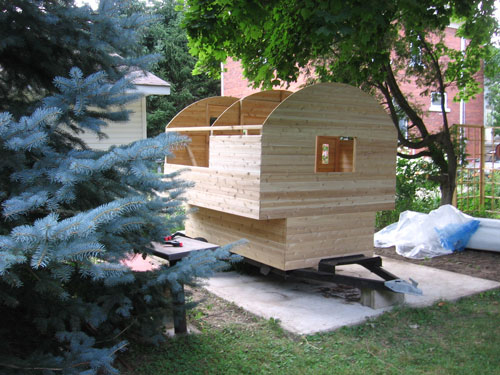 Her description is “all cedar, with a roof like a cedar strip canoe. 7′ long, 6′ wide at the ledge, and 6′ high in the centre.” I presume the roof will be epoxied over glass or there will be a covering over the entire thing. If you’ve wanted your very own mini caravan but don’t have the time, tools, or inclination, this might be one for you. Below is another creation of hers from earlier this summer. Click the photo to see more at her website. Thanks so much for the response. If its okay with you I’ll make a small post to highlight your build and link to you images. Sure, thanks! I’ve been following you for months now and really enjoy all of your posts. This is the only blog that I actually read all the posts! I hope someday we can meet, maybe at Pensic if you make it east in the future. It was your vardo that turned my idea from scotty rebuild to vardo, so I’d love to see it in person. Thank you for doing such a fantastic job posting your build and sharing many details. Inspiring, as are most of you blog posts too. Thanks! Wow! I am flattered by your comment. Thanks a lot and please feel free to comment, criticize, or suggest direction for this blog. It truly started out as a way to show some friends and family what I’m up to (as an eccentric of sorts) and I found that it is sometimes a fun outlet and great way to meet like-minded people. I can’t wait to see your finished wagon.